“Waiting On Wednesday” is a weekly meme hosted by Breaking the Spine. Every Wednesday we get to highlight a book that we’re really looking forward to. My book this week is : Norse Mythology by Neil Gaiman. Oh my giddy aunt! Norse mythology. Neil Gaiman. Do I really need to say it again. Okay. Third time’s the charm: Norse Mythology – Neil Gaiman. Colour me happy. In Norse Mythology, Gaiman stays true to the myths in envisioning the major Norse pantheon: Odin, the highest of the high, wise, daring, and cunning; Thor, Odin’s son, incredibly strong yet not the wisest of gods; and Loki son of a giant, blood brother to Odin and a trickster and unsurpassable manipulator. I really like this one – the whole floating graveyard! This is beautifully illustrated, I admit this cover originally made me think this was a children’s book but I really like it now. This is the version I own – and I do love it – plus it’s signed! So, we have the first cover with the young girl, the second cover with the young boy and the third cover with the boy and the girl in the background. I like all of these covers for different reasons but without doubt my favourite is the third. I like the fairytale feel, the style of the font and the title framed by the trees and then in the very back the two figures like two shining lights emerging from the dark. 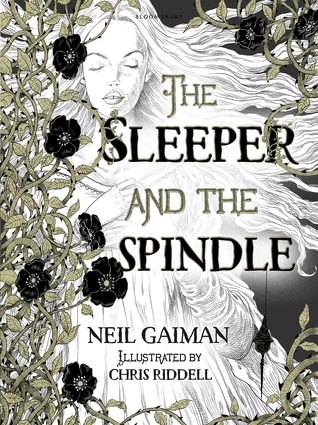 Just finished reading The Sleeper and the Spindle by Neil Gaiman which is a beautifully illustrated story. This really is a gorgeous little book, a reimagined mishmash of Snow White and Sleeping Beauty with a bit of dark and creepy thrown in for good measure. It is a good story with an interesting twist in the tale and modernised in terms of a Queen coming to the rescue as opposed to a dashing knight in shining armour and I certainly wouldn’t discourage anybody from reading as, like I said, it is good. It just didn’t have that certain something that I can’t usually put my finger on but I always find in a Gaiman book that makes me want to run out and gush like a maniac. It is a lovely book though and I have already ordered Hansel and Gretel as well – I just need to be more measured with my ridiculously high expectations I suppose – at the end of the day you can over hype something all by yourself. And, just feast your eyes on that cover!